Dr. Seuss is not just for the kids. He has a lot to teach about addiction and mental health. Dr. Seuss wants to talk about addiction and those pesky mental health crises, but not the same thing they are. Maybe in pain, or in anger, or you were ready to run. But mountains you moved through alcohol, marijuana or needles. And the depression, the anxiety, and the trauma, they are different evils. There is a part of you that loves the risk, the rush and the high. If a little is good then more, and more, and more you must not deny. My hope with this piece is that you are inspired to perspire and filled with new desire. That is how it progresses, this dis… order. Not a Sunday rain, but a full-on-attack-of-the-worst-kind. Does not matter, they take you where you never planned to go. Recovery can happen and, my friend, here is how it may be, you see. And walking, with your feet, because this will help you to resist defeat. Don’t give up, otherwise, you will stay down and never get up. But not many numbers for that would be cruel. Addiction once hit you like a tool, but now you will use it for fuel. Remember that recovery is not about never falling, it’s about caring. And get going for it’s about to get snowing. Others gravitate to groovy-groups, but remember it’s got to be done your way. The conclusion of the matter, it matters a lot. And remember that matter, well that’s heavy. No copy, no double, not twin, no one else. You are you, a miracle. A full-blown stardust heaven-born miracle of miracles. Telling you that you are just one big failure, flat as pie. Cling to you, for you, are the only you that you have. And sing, my friend, sing. His words are in italics, right here for our everyday use. If this piece has inspired you, you will want to read, read, read. I have plenty to say, so you will want to read my blog. You can see Laughing Loudly While Crying into Your Beer and Addiction: A simple path. I like to write, write, write. My topics are wellness, leadership, parenting and personal growth. Oh, the pains it took to say all of that, I am just too awake to neglect my nap. My hope is that you are inspired to perspire and filled with new desire. Remember that it is Dr.’s orders to Sign up for my blog if you want to receive the biggest and the bestest of my writing. Keep it Real and get on with living because there’s fun to be done! 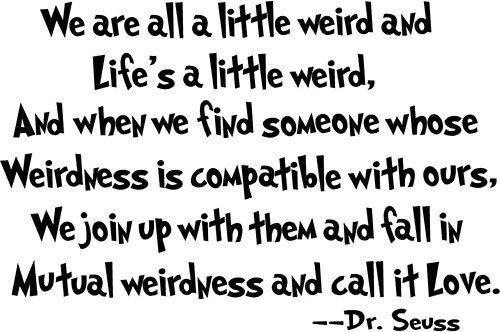 If you liked the Dr. Seuss quotes, click here for more.